Flying icon: Inside the Vulcan cockpit Jump to media player As the final flight of the only Vulcan bomber takes place this week, the BBC's Danny Savage has a look inside the cockpit of the iconic plane. Vulcan's flypast tribute to factory Jump to media player The last flying Vulcan bomber aircraft flies over the Greater Manchester factory where it was built as part of a farewell tour of the country. Vulcan bomber's final northern flypast Jump to media player Vulcan tours the north for one last time as part of its farewell celebrations. Vulcan's last public display flight Jump to media player The last surviving flying example of the British jet plane makes its final public display flight over Bedfordshire. Last Vulcan bomber's final flypast Jump to media player The last flying Vulcan bomber aircraft performs its final flying display in the north of England. Tens of thousands at Swansea airshow Jump to media player Tens of thousands of people attend the Wales National Airshow, where the last Avro Vulcan entered its final flying season. 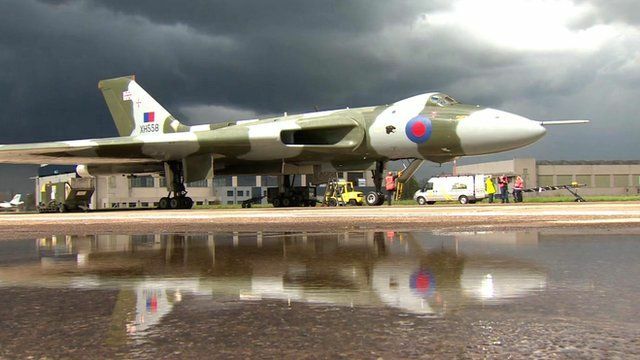 The last flying Vulcan bomber will take to the skies for the final time before the end of the month. It causes a stir every time it flies due to its unique shape and earth shaking roar. It has been hugely popular at airshows for several years and is best known for carrying out the longest ever raid of its kind during the Falklands War in 1982. But experts say it has to stop flying. Danny Savage got a tour of the cockpit from Chief Pilot Martin Withers at its base at Robin Hood Airport near Doncaster.